DUBAI, 22nd May, 2017 (WAM) --The World Government Summit, WGS, has discussed global progress in forecasting the future and developing solutions for the expected challenges decision makers have to face in the public and private sectors. This came during a session entitled, "Future Trends and How to Forecast Them", which was organised to support governments’ efforts to forecast and shape a better future for public and private organisations by encouraging members of the UAE-based international organisation to learn and employ advanced skills and tools that allow them to develop future solutions. The audience at the session included Sheikha Lubna bint Khalid Al Qasimi, UAE Minister of State for Tolerance, Hussein Al Hammadi, Minister of Education, Dr. Ahmad bin Abdulla Belhoul Al Falasi, Minister of State for Higher Education, Jameela bint Salem Mesbeh Al Muhairi, Minister of State for Public Education and 100 general managers of government agencies and executives from leading national companies in the UAE and the region. Omar Sultan Al-Olama, Director of the organisation, stressed that this session is part of the organisation’s long-term efforts to implement the vision of Vice President, Prime Minister and Ruler of Dubai, His Highness Sheikh Mohammed bin Rashid Al Maktoum, who has stated that to successfully shape a better future for a nation, its government must be committed, and equipped, to forecasting that future and proactively implementing measures to mould it to the benefit of its people. Governments must, additionally, plan ahead to anticipate and address future challenges and encourage society to adopt a future outlook. 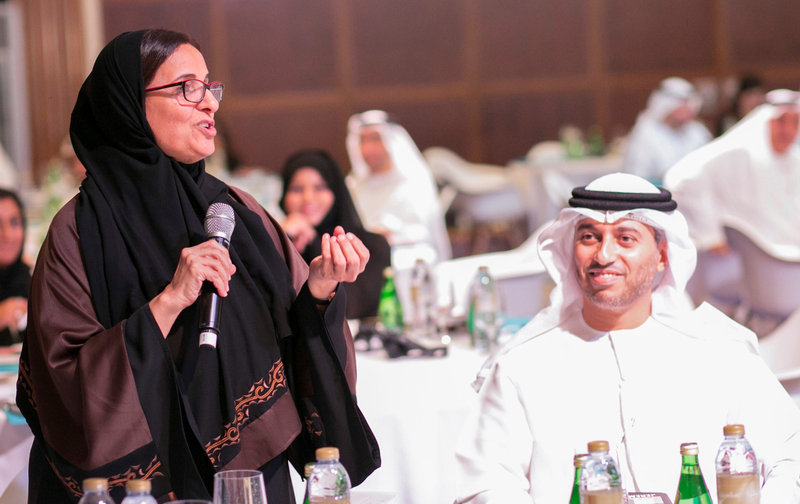 Al-Olama noted that these sessions position the organisation as a platform for exchanging knowledge and expertise, and developing future-related skills and capabilities. This supports the UAE government’s objectives to encourage decision makers across various sectors to become 'future-ready'. These sessions exponentially develop scientific content, he explained, adding that they are key factors in disseminating future-centric knowledge and tools. Global expert Jeremy Gutsche, Founder and CEO of Trendhunter.com, was keynote speaker at the session. Gutsche is a best-selling author and one of the most renowned global speakers on the subject of forecasting future trends. Trendhunter.com is the world’s most popular trend spotting website, it has generated more than 2 billion views from 150 million visitors, and has collaborated with over 500 brands and billionaires around the world. The session shed light on the most prominent trends that stand to shape the future, introducing methods to anticipate them, analyse them, and specify the sectors that will be most affected by them, in addition to exploring effective solutions for the challenges that are likely to face them.